CINCINNATI Precision Machinery represents many different companies for your HVAC , Roofing , and Sign businesses. We offer an extensive variety of sheet metal fabrication equipment from hand tools that shear to coilines for your duct manufacturing. Take a look at these metal fabricating machines or give one of our knowledgable salesman a call to help you find the piece or pieces of equiment that best suites your sheet metal fabricating needs. 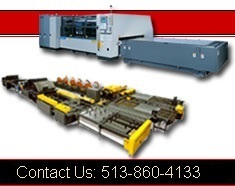 Contact us about ANY New OR Used Sheet Metal Machinery needs that you may have.